FCA unveiled the first images of the new generation of Jeep Wrangler 2018 in the US, coming to the US market next year. The official presentation will take place only on November 29 at the Los Angeles Show. The classic of the brand arrives with a slightly updated look, without losing the style DNA that characterizes it. Heir to the spiritual of the old Jeep of the Second War, which came to be manufactured in Brazil in two different plants of Willys Overland (São Bernardo do Campo-SP, where Ford is today, and in Jaboatão dos Guararapes-PE, metropolitan region of Recife). But back to the Jeep Wrangler 2018, Fiat Chrysler’s 4 × 4 utility was unveiled in both the four-door Unlimited version and the more traditional version with no bonnet and two intakes. But, the Jeep Wrangler 2018 brings an interesting novelty, which in fact was already used in the times of the original model, the folding windshield. The brand says that this feature allows “more freedom in the outdoors”. Adventurers should like this. To please purists and fans of the brand, the company will reserve dozens of combinations of ceiling, doors, and windshield for anyone to the fault. In the visual, the Jeep Wrangler 2018 features a grid with seven openings already known, but now slightly sloping at the top and with an improved finish. What is even more striking, however, are the larger circular LED headlights, plus an additional set right in the center of the projector, which houses the Full LED headlights. In the high fenders, the model now comes with daytime LEDs and steering repeaters integrated into the DRL’s design. The bumper has been fully updated and receives fog lights more spaced apart, in addition to a chrome finish. The well-known hood with latches on the sides now has new locking devices. The doors are apparently the same, but the door handles have been updated. The square mirrors have gained new support. The front mudguards gained elegant air vents, while the wheel skirts received an additional black spray. The taillights are not fully displayed, but logically they must have been updated. The alloy wheels look sportier, but without losing their sturdiness. 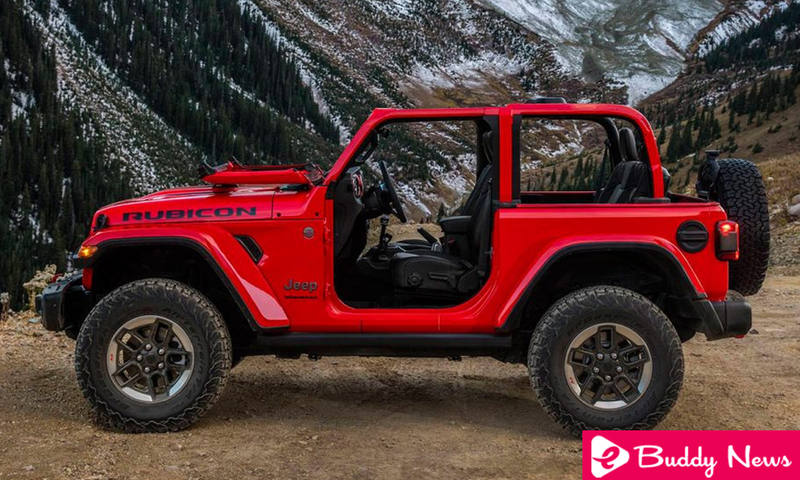 For now, that’s what the Jeep reveals about the Wrangler 2018. The mystery of the brand, however, is greater with regard to mechanics, but only says that the Jeep Wrangler 2018 comes with “advanced fuel efficiency” propellants. However, rumors in the states speak of a 2.0 Turbo with great power and 3.6 V6 versions Pentastar and V6 3.0 diesel (VM Motori). By the configuration, the access version could be the V6 3.6, passing through the diesel and reaching the expected 2.0 Turbo of no less than 373 hp. Let’s wait and see.